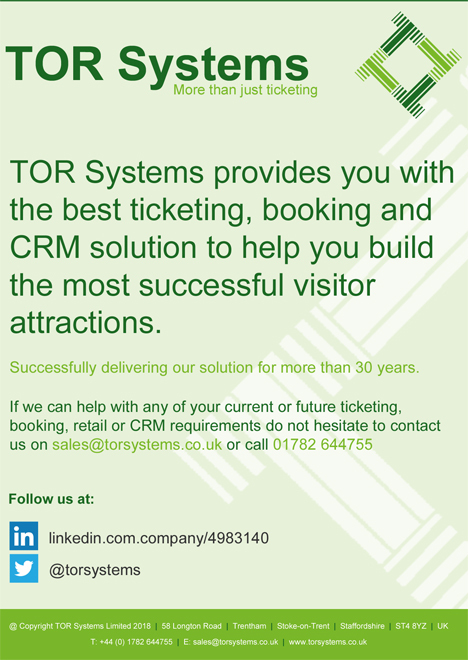 Founded in 1981, TOR Systems is the longest established UK provider of ticketing and booking systems within the attractions sector. Started by John Jordan and now owned and managed by his son Daniel Jordan, the business continues to grow from strength to strength. The system has had a huge amount of investment over the years and today provides functionality within ticketing and booking for groups or events, walk-in admissions, timed and capacity-controlled activities, online bookings, membership, trade sales, flexible reporting, CRM, retail and catering, as well as opportunities to integrate to third-party systems. Unlike many system suppliers, we began as an operator, rather than as a supplier. We decided to take our real-life operator’s experience and create a system that met our requirements and in turn provided a solution for the wider industry. Not only do we employ a team of experts in design, development, as well as dedicated project managers, but we ensure our real-life operator’s experience is maintained by ensuring members of our team have hands-on experience of running and developing attractions. We support the UK visitor attractions sector including museums, galleries, theme parks, viewing platforms, heritage sites and gardens, including the British Museum, Imperial War Museums, Brighton Pavilion and Buildings, British Airwaysi360, and new customers like Bournemouth Oceanarium and many more. Ticketing Professional Conference, Museums & Heritage Show, Museums Association Conference, Balppa, Visitor Attractions Conference.